Summer vegetables and herbs combine beautifully with brown rice in this dish. Using only the green parts of scallions adds delicious allium flavor, while keeping the recipe low in FODMAPs; serve the leftover sliced scallion bulbs on the side for dining companions who are not following a low FODMAP diet. 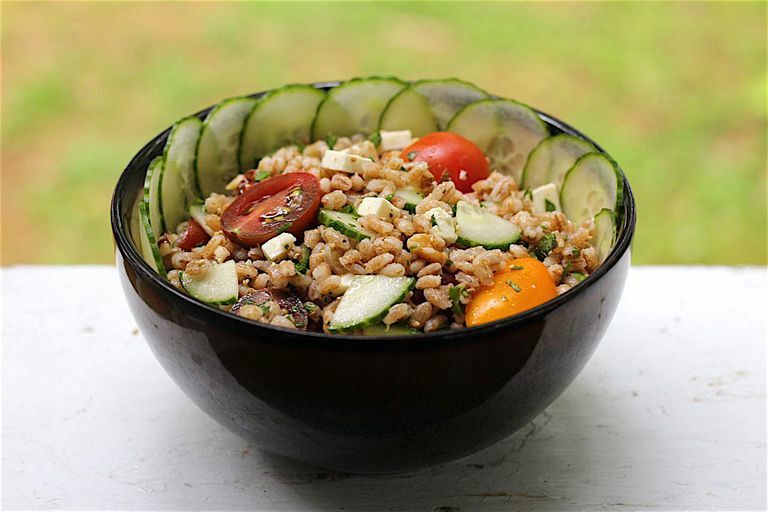 In addition to being IBS-friendly, Greek brown rice salad incorporates ingredients such as olive oil and walnuts to please the palates of Mediterranean diet enthusiasts. This grain salad can be served as a side dish at your main meal and leftovers can replace sandwiches in your lunchbox! In a medium saucepan, bring water to a boil over high heat. Stir in rice, reduce the heat, cover and simmer until rice is tender and water has been absorbed, 35 to 40 minutes. Remove from the heat and allow rice to steam for 5 more minutes with the lid on. Then, remove the lid and allow the rice to cool until it is close to room temperature. Stir in the salt, pepper, lemon juice, olive oil, herbs, scallion greens, crumbled feta, cherry tomatoes, walnuts, and cucumber. Serve promptly, or refrigerate tightly covered until serving. An equal amount of any low-FODMAP vegetable can be used in place of the cherry tomatoes and English cucumber. Pine nuts or pecans can be substituted for walnuts. Other low-FODMAP grains can be used in this recipe in place of, or in addition to, rice. Use a total of three cups of cooked rice, quinoa, millet, buckwheat, or sorghum. The type of brown rice (short grain, long grain, and so on) determines the cooking time and the ideal amount of water that should be used. Use the information provided on the rice package if available.